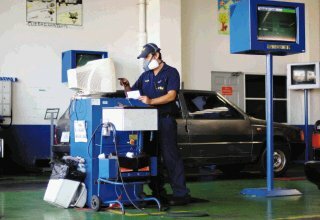 Those who drive any type of vehicle in Costa Rica must take their vehicle to be examined once every one or two years. This is done at any of thirteen locations throughout the country. This is known as Revisión Técnica or Riteve for short. Not well known is that they also have four mobile units that service remote areas North, Central, South and Los Santos. How often you must go depends on the age of your vehicle. Newer vehicles must go every two years and those who drive older vehicles must go in ever year. My license plate ends in a six, so June is my month, and I just had it done yesterday. Cost for a passenger car is just under 10,000 colones or about $20.00 at the current exchange rate. If this topic interests you (and it should even if you are an old pro because I am including some helpful info, read on!